Combining a bunch of email services to receive at one email account may not sound a very good idea as a lot of emails keeps popping on individual mail ids. But for sure it could save your time if you carefully look into it. If you are from a busy working field or have a tough schedule you may not be able to do multiple logins and check all that you have received. In those cases, you can surely take advantage of this utility. Many times keeping records of those many login-password combinations become a difficult task and hence combining many emails incoming at on location becomes a wiser solution. On the other hand, you can take care of those unnecessary subscriptions and spams using filters and locks to be able to keep your inbox limited and healthy. In this article, we will see how to add multiple accounts into single Gmail settings to enable receive-send function easily. Google Gmail provides an excellent option to receive and send emails from many other services such as yahoo, Hotmail, Rediffmail etc. Just imagine how much of your time will be saved? In your single Gmail inbox now you will receive all those emails coming from many places. For merging accounts into single Gmail, you need to edit and add those email logins into your Gmail settings. All you need to do is to add them at once and allow confirmation sent to their email inbox respectively. Sign in your Gmail account and wait till it loads fully. Now go to settings by clicking the small gear icon at right corner. Select Setting option. Choose Accounts and click on Import tab and select 'Add another email address ou own'. Click on Add another email address option and add emails you want to access on this server. Click on to Next step button. Google will send a verification code to ensure security. Get the verification codes on individual email services and confirm that you have allowed the send receive successfully. After confirmation, you can use forwarding option from your other account to send those mail copies on your Gmail inbox. If your external mail service doesn't support forwarding feature then you can use 'Mail Fetcher' available in Gmail. Most of the email services support standard 'POP3'. 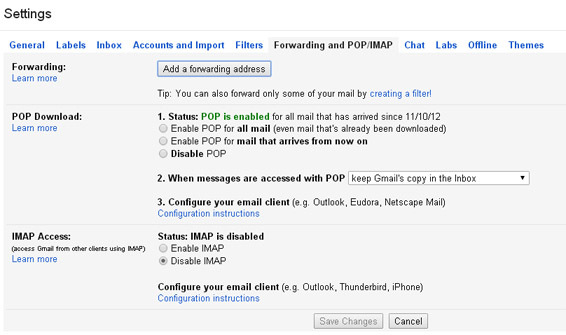 Click on “Add a POP3 mail account you own” link. With this now you will be able to get all those emails in your Gmail inbox and also you will be able to send emails through those services to anyone.